Sun. #1 is HERE. To help the website out please subscribe to Mistah MegaManFan so we can reach 1,000 (current count: 819). If you're a gamer you'll enjoy the content! Don't miss Impact Wrestling highlights from yesterday. With the cheap plugs out of the way here's Sunday's latest wrestling news! 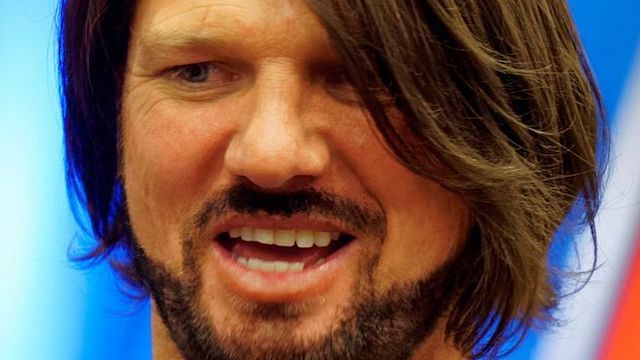 Via social media AJ Styles has denied coming to terms on a new contract: "What was that? Are you sure? Please let me know the more because I know nothing about this." This was in response to a previous report from Wrestling News World claiming that AJ had renewed with WWE. New Japan New Beginning results courtesy of PWInsider.com are below. This was fantastic. Narita has been getting over an incredible bridging belly to belly suplex as a finish on this tour, and that was the story of the match. Uemura looked great too, he is in fantastic shape. He hit a great running corner dropkick. He blocked a belly to belly attempt and hit a double arm suplex, and then went into the Boston Crab, but Narita escaped and then caught Narita in the bridging suplex, which might be the most beautiful looking move in NJPW. Some really good stuff in this. Henare is becoming more and more polished with every match and Umino is a future major star in NJPW. Umino was worked over until Yoshida took it to Nakanishi off the tag. Umino then got back in and exploded on Henare. Umino hit a great rolling arm bar. Henare hit him with a pop up Samoan drop and a running spear, but Umino kept kicking out. Henare finished him with a Uranage. Some of the young lions are seemingly being allowed more freedom to stray away from the usual simplistic move set. Umino used the armbar here and has also been using a fisherman's buster. Toa Henare could have a big year this year. His goal should be a spot in the G1 Climax. There was a lot of plodding around and shouting in this one. Iizuka is retiring on February 21st. Lots of brawling and cheating from Suzuki-Gun. Tenzan started dishing out Mongolian Chops and Mountain Bombs. He went for a moonsault, but Iizuka attacked him with a chair and caused a DQ. This looks to be building to Tenzan getting his revenge on Iizuka's last night. This new CHAOS/GBH/Taguchi Japan alliance, brought together by a mutual hate for Bullet Club are the New NEVER Openweight Six Man Tag Champions after Yano, Makabe & Taguchi won them a few days ago. Tama Tonga is a “good guy” now and gets “upset” when Bullet Club don't play by the rules. This was a fun match, but nothing out of the ordinary. Lots of good action with everyone getting their moment to shine. The finish saw a Yano low blow and roll up on Yujiro. Really funny moment at the start of this when Taichi held the ropes opened for Naito, and Naito gave him the most sarcastic bow you will ever see. Really good match here, building towards two title matches on tomorrow's show. Shingo was worked over for a quite a while. Naito and Taichi went back and forth, but Suzuki-Gun were able to mount triple team attacks and keep the advantage in the match. Kanemaru sprayed whiskey in the eyes of BUSHI, to set up the finish as Taichi hit him with a back drop driver to get the pin. After the match BUSHI had his mask taken. This was incredible. Early on, SANADA put Suzuki in the Paradise Lock, which of cause was a major mistake. Suzuki then tried to murder him. He blasted him with chair shots on the outside and SANADA almost got counted out. SANADA tried to use his speed to turn the match around, but he was once again mauled by Suzuki. Suzuki unloaded with the stiffest of forearms. SANADA locked on the Skull End, and went for a moonsault, but Suzuki got his knees up. Suzuki then just completely overwhelmed SANADA with slaps, until SANADA was out on his feet. But SANADA was still able to block piledriver and sleeper attempts. There was some phenomenal back and forth in the final couple of minutes as they blocked and countered each other's finishing moves, until Suzuki was able to quickly nail a Gotch Style Piledriver. This is must-see. This was another excellent match. Sabre ripped apart EVIL, targeting the shoulder. EVIL struggled to mount any sustained offense, until he forearmed Sabre off the apron, and he took a nasty fall. He dropped him with a fisherman's buster on the ramp and hit Darkness Falls in the ring for a near fall. EVIL hit a big lariat for another near fall. They battled on the top rope as Sabre used an octopus, but EVIL turned it into a huge superplex. Sabre almost caught him with some silky smooth pinning combos, and EVIL almost won with one of his own. EVIL hit another big lariat and went for the STO, but Sabre countered into a victory roll and a bridge, which EVIL was able to roll through on and get back into the STO, this time hitting it and scoring the win. So they have one win each in singles competition as we head into tomorrow's IWGP Tag Team Championship Match as Sabre & Suzuki challenge EVIL & SANADA. This was another big statement from Jay White as he receives a monster push in NJPW. This was the first time Tanahashi and Okada have teamed up in a straight tag match, as they come together to fight off a common enemy. Yet, these two super powers together aren't enough to stop the momentum of Jay White. Tanahashi had his right leg targeted, and Okada was also worked over for a time. The dream team put some double team together. After Okada couldn't take down Fale on his own, it was a double suplex that did it. Okada hit a Tombstone on White, and handed him over into a Tanahashi Styles Clash. Gedo interfered and stopped a High Fly Flow attempt and from here the match took a big turn. After some back and forth, White was able to hit Tanahashi's injured leg with a chair. White locked Tanahashi in an inverted figure four as Gedo held back Okada. Fale then hit Okada with the Bad Luck Fall as Tanahashi screamed in agony. Knowing he had no chance of escaping, The Ace tapped out. This was a major win for White. After the match he cut a fantastic promo and dropped Tanahashi with Blade Runner. NJPW have done a phenomenal job of building Jay White into a top main event star, and there is every chance that he will take the title from Tanahashi at The New Beginning in Osaka in a couple of weeks. This show is available now at NJPWWorld.com. In addition some New Japan videos are below. According to this report the Lucha Bros (Pentagon Jr. and Fenix) are NOT exclusive to All Elite Wrestling. Via social media PJ Black (fka Justin Gabriel) announced he's signed with Ring of Honor. On his latest podcast Sam Roberts says he's not apologizing to Bianca Belair: "On Saturday night, I was not fed an opinion in my ear, I know that's one of the theories. I've never been fed an opinion in my ear. They wouldn't bring me to give their opinion, I'm not good at that. I just go on and they just ask me to be me, and give my opinion. I had a crisis of conscious in that moment. I felt like I was just going along with the show, so I decided to say exactly how I felt in that moment. I know that Mark Henry has started a campaign saying that I owe Bianca Belair an apology. I certainly will not be apologizing to Bianca Belair because my opinion is my opinion." In this interview Taya Valkyrie talks about the Knockouts Division: "Within the Impact universe, there is the opportunity for all of us to shine. There's not just one storyline or feud going on, there are several so it's multi-dimensional. Every woman has an opportunity to shine and I think that's really cool. Obviously certain stories are going to cross over and things are going to change... so you really don't know where and what direction we're gonna go. But it's just as exciting for the fans as it is for us. I really hope that we're doing something different that everyone's really enjoying." Here Tommaso Ciampa talks about WWE and the "main roster" on TV: "A lot of people keep saying that NXT is the next generation, future stars. They're wrong. We are the current stars. We're the present. I am the NXT champion. I am the greatest champion in all of sports entertainment. That's not excluding RAW and SmackDown, that's including them. There is no getting called up. If anything those people should hope they be brought back to NXT. This is the hottest brand in the entire universe right now." Speaking of "Lawlers" Jerry Lawler says he taught Becky Lynch a better worked punch: "I told her, 'Gosh Becky, I don't know, that's just the way I threw a punch from the time I started back in 1971. That's just - I don't know - it's hard to tell somebody how to throw a punch. And that's all you can do basically, is watch somebody else and you see one that you like, and that's exactly what she was saying. She liked the way I threw a punch and she wanted to try to emulate that. And I told her... I would try to throw a punch sort of in the same way if you were in a real fight, where you would hit somebody. I would throw a punch right at somebody's nose, right at their jaw or something like that, their mouth or whatever. And I don't know, I would try to make my fist not be so rigid and hard, as if I were gonna try to knock somebody out. I would always make my fist in to, like, a shock-absorber. And then I would throw that punch right where I wanted to." NJPW results from Charlotte, NC courtesy WrestlingInc.com are below. STARDOM results from PWInsider.com are below. * Natsu Sumire won a 3-way match over Ruaka and Rina by pinning Rina with an inside cradle. * AZM and Konami beat Starlight Kid and Hina when AZM pinned Hina after a flying double foot stomp. * Kagetsu and Hazuki beat Hana Kimura and Bobbi Tyler when Hazuki got the fall on Tyler. * Future of STARDOM Champion Utami Hayashishita pinned Alex Gracia with a German suplex. * Mayu Iwatani, Tam Nakano, Arisa Hoshiki, and Saki Kashima beat Jungle Kyona, Natsuko Tora, Kaori Yoneyama, and Saya Iida when Hoshiki pinned Iida after the Brazilian Kick. * Wonder of STARDOM Champion Momo Watanabe pinned Jamie Hayter with the Peach Sunrise. This was Wantanabe's 10th successful defense of the title which now ties Io Shirai's record. Sendai Girls results from PWInsider.com are below. * Mikoto Shindo used a Boston Crab submission to defeat Manami. * KAORU beat Sakura Hirota. * Meiko Satomura and Alex Lee beat Leon and Ray Lyn when Satomura used an STF on Lyn. * Hikaru Shida pinned DASH Chisako after the Tamashii no Three Count. * Tag Champions Mika Iwatani and Chihiro Hashimoto went to a 30-minute time limit draw with Hiroyo Matsumoto and Sareee.